Well, folks, it happened. We aren’t even officially into the Easter season, and one of our friends has already sent us the CUTEST little marshmallow Peeps creation we’ve ever seen. And for as adorable and delicious as it looks, the directions are remarkably simple! Did we mention it’s also a rather cheap recipe that involves no cooking or baking, so you can easily involve the kiddos in the process? Yep – pretty much Easter recipe perfection we’re working with here! So what exactly will you be making? 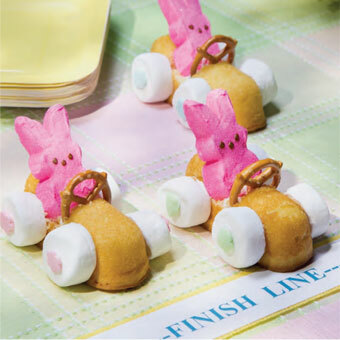 Start your engines for Easter Bunny Racecars! Before we get into the directions for these, we feel it’s necessary to understand that the miniature pretzel will serve as the steering wheel. See the picture above to really take in just how impossibly adorable that is! OK, we can move on now. The first step involves cutting a small rectangle from the top of the cream-filled cake of your choosing. Since you won’t be using this removed part anywhere else in the recipe, be sure to put it to good use by eating it! The space provided by cutting away the rectangle of cake will serve as a driver’s seat for your Bunny Marshmallow Peeps, which you will further secure to the cake with a dab of white decorator icing. Once the Peep is settled into his or her seat, use the decorator icing once again as ‘glue’ for the mini pretzel steering wheel and marshmallow tires. Ready to get really creative? That’s where the frosting and sprinkles come into the equation. Make each car unique by getting daringly decorative with these two ingredients. Always wanted your initial on the hood of your car? Now is your chance without worrying about resale value! St. Patrick’s Day is But a Month Away! 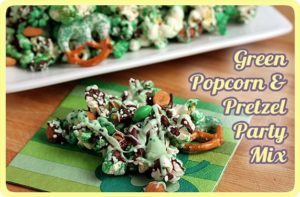 Green Popcorn & Pretzel Party Mix: There are few things luckier than stumbling across a party-worthy recipe that looks great, is full of ingredients that almost everyone loves, and is super simple to make. But that’s just what happened when we found the Green Popcorn & Pretzel Party Mix recipe at The Yummy Life! This sweet and salty snack could be your ‘big treat’, taking center stage with its mix of chocolate chips, pretzels, popcorn, green M&M’s and more. Want to make it a bit minty? Consider using Mint Dark Chocolate M&M’s! 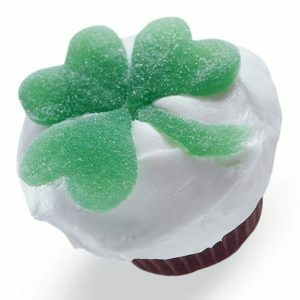 Shamrock Cupcakes: These simple but striking cupcakes make an especially wonderful treat for those whose candy tastes lean a bit toward the nostalgic side. While gum drops and Spearmint Leaves aren’t as popular with youngsters as they are with more mature candy fans, youngsters aren’t the only ones eating cupcakes! Perhaps you have to grow up on Spearmint Leaves and Orange Slices to understand how oh-so-good they really are. Lucky for me, I did! 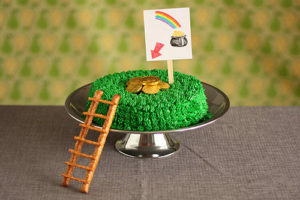 Leprechaun Trap Cake: This is the recipe that had me calling people over to my desk. If I could make mine look half this amazing I’d be thrilled! As if the ladder made from pretzels wasn’t darling enough, the pretzels make another appearance on top of the cake beneath the chocolate coins. What are they doing there? Oh, just being an important part of the leprechaun trap. As for the cake itself? Well, that just happens to be a rainbow inside. Yep – coolest, luckiest cake ever!